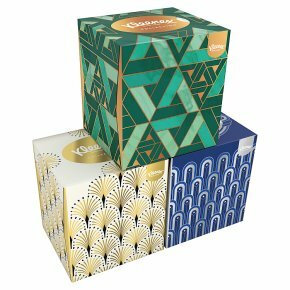 Kleenex® Collection Cubes, on-trend and contemporary designs that are stylish or complementary to your home décor. Contains 56 tissues. Kleenex® Collection Tissues. Single Box. Kleenex® Collection Tissues. On-trend and contemporary designs that are stylish or complementary to your home décor. Available in 3 contemporary designs, which are refreshed on a regular basis keep up to date with current trends. Kleenex® Someone needs one The design that you receive may vary from image shown.